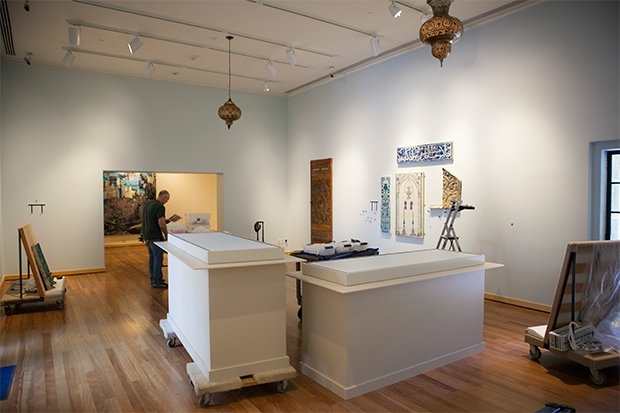 For the last month the Islamic Art Gallery has been closed while it undergoes a redesign and reinstallation. The project—done in collaboration with the Doris Duke Charitable Foundation and its museum, Shangri La—aims to transform a static space featuring classical Islamic art to a flexible space capable of accommodating contemporary works by participants in Shangri La’s prestigious Artists in Residence program. The gallery reopens Thursday, Oct. 6, and Shangri La executive director Konrad Ng and curator of Asian art Shawn Eichman share their excitement about the new space, and reveal their favorite works that visitors can enjoy come Thursday. In addition to the new layout, the reinstalled gallery will feature an iPad loaded with information about Shangri La, which visitors to our sister museum can use to discover more about Doris Duke and her O‘ahu home while they wait for their tour to leave. Find out more about how to book a tour to Shangri La here.